For a long time, there was a chance that Twitter would not join the ranks of publicly owned corporations — that it wouldn’t be around to join it, or that it would choose not to. 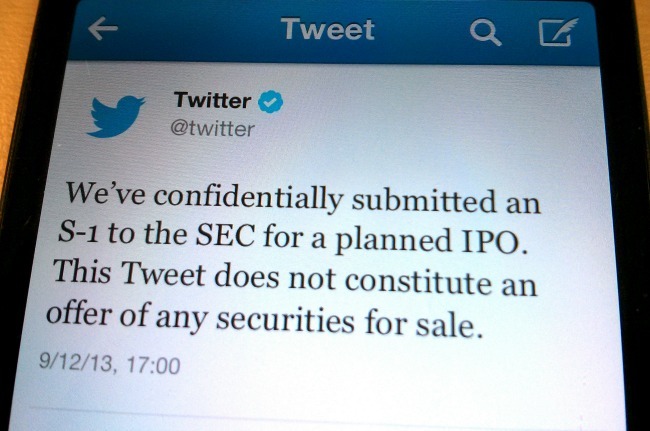 Around 5 pm Eastern today, Twitter announced that it had confidentially filed for its initial public offering (IPO). Rumors of the company’s coming IPO had been in circulation since late August. A recent design change, which took the service’s tweets out of chronological order in order to make it more understandable to “the general public,” only quickened the mill. Now we know for sure. So, sometime in the next six months, the company will careen toward public ownership. No longer will it be a young, California-born upstart (not that it’s been that for a while); no longer, too, will it be categorized as a startup. It will be John Q. Public company: With a stock price, a ticker symbol and a regular revenue report, it will join the pedestrian landscape of American business. But, for a long time, there was a chance that Twitter would not join that landscape — that it wouldn’t be around to join it, or that it would choose not to. This isn’t a comprehensive list by any means, but as we prepare for the NASDAQization (or NYSEification) of Twitter, it’s worth looking back on some historical “texts,” of a sort, from the company’s history. These blog posts — there are two of them — reveal what we might think of as Twitter’s alternate universes. They show paths not taken, ideas not imagined. 1. A pedestrian podcasting company never hatches Twitter. One day, Biz Stone and I were driving home from work, it all clicked for us. We were talking about how Audioblogger was great, but we didn't tend to actually listen to the posts much, when we came across them on the web. However, there I was, paying for and downloaded spoken-word audio from the web to listen to on my iPod. Why, we thought, couldn't you get the interesting, new audio-blogged posts on your iPod when you synched it and listen to them where it made sense? Yes, that Biz Stone! The other guy connected to Medium. 2. Twitter becomes a medium, not a business. While Twitter has been growing in mainstream significance and popularity, it hasn’t managed to adopt a strategy that clearly aims the company towards mass market success. I think #newtwitter changes that, turning the site into a rich information discovery platform, if you’ll excuse the buzzword bingo. I believe that Twitter as a medium is and should be distinct from Twitter as a business. Put another way, there’s an important difference between lowercase “t” tweeting and uppercase “T” Twitter, just as with democrat and Democrat. Payne wasn’t the only member of the company who felt this way. There’s an alternate universe where Twitter followed the wishes of those employees and decentralized, distinguishing itself from the private, “walled gardens” of Facebook or LinkedIn. There are many microblogging providers, in this universe, not just Twitter. To decentralize would’ve entailed some large technical challenges for the company. A decentralized Twitter could never have become the home for breaking news it is now. To decentralize, too, would’ve challenged Twitter to find a different kind of Internet business model. Maybe it would have had to charge users, or offer additional services. But a decentralized Twitter might, today, have found itself at the middle of an expansive and flourishing microblogging and personal information delivery ecosystem. That Twitter, which Payne describes it, would be quite different from Facebook or any of the other big social networks. Twitter chose not to do that — and now we know about the IPO which Payne proleptically alludes to — but there’s a universe in which it did. And, there, we’d be looking at a fundamentally different, and possibly more democratic, tech landscape.